Yesterday was just so crazy; I managed to do so much; I had to, as I am leaving today. 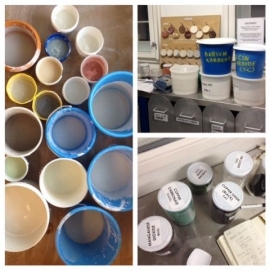 I opened two kilns to reveal the oxidised glaze firings; the majority of the work I have been making since I arrived. It’s all been too quick to contemplate the work I have made yet. I did manage to lay the pieces out, more or less in the formation it will be displayed. I thought I had made far more pieces than I needed, and I did, considering I have now got two exhibitions, rather than one, as originally planned. I worked like an automaton making, producing, and turning out casts, but in the end I have exactly the right number to fit the plan I drew for the wall in The Ceramic House. The other piece is smaller, but that’s because it did not all fit in the firing. There were several pieces that didn’t survive firing and stuck to kiln shelves because the glaze ran, and in fact many pieces broke before being fired. One of the problems I have been trying to resolve whilst here is to make these long fragile pieces strong enough to survive. 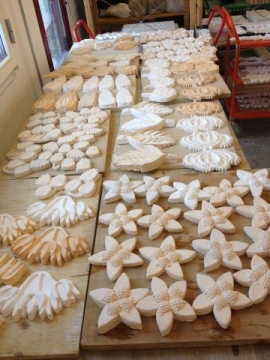 The main problem was getting them into the kiln without breaking. 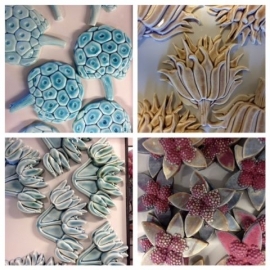 I experimented with many methods and found my technique, which was to get them on to a kiln shelf straight from the mould, practically, and not touch it thereafter. Some pieces broke even while I was glazing them. So fundamentally I am attempting to do an extremely difficult thing by designing them like this! Multi-layered, with weaknesses where the thinnest or narrowest parts are. But the results are gorgeous. I am pleased, especially, with the soda firing. That was a revelation. I never thought I would do wood firing, preferring bright colours, but maybe I’m changing. The colours are a rich, more limited range of reds, yellows and browns. I love them. I think I am a convert! I do like high-firing, i.e. using stoneware glazes, rather than earthenware glazes, that are flatter and sit on the clay surface. Stoneware colours are earthy, more muted, and provide the texture I love; mottled surfaces, variable glazes; exactly what happens in soda firing. Then after laying them out, I spent the rest of the day (6 hours), packing my work into 20 boxes. I finished that around 11pm, then moved into my room and packed up the remainder of my things, which took me until about 1am, when I started sorting through all the boxes of artists’ work I am taking back to Brighton. I managed to condense 20 boxes into 15, which took me through until 3am. And now I have to get up and start packing the car. But here I am on the computer! The song of our times; fitting in a lot, and then more, and then all those other things on top that are demanding, screaming for attention. Throughout all of yesterday I was writing and responding to emergency emails about the exhibition, things that could not wait, such as the journalist who has asked some very in depth questions about the Danish ceramics scene and has to have the info by today (Friday), involving chasing up the writer I have contracted to write the essay for the catalogue, from whom there has been a resounding silence since agreeing to the job. But she responded! One off the list. Then the liaison between myself and my graphic designer and the PV invite, which I have not had a minute to send out yet. Just as well, as I’ve changed the design. And as for social media…! Moral of the story: do not attempt to do a residency and make a huge amount of new work while organising a fairly big exhibition simultaneously! The big worry now is getting insurance for the trip, as not all the artists have given me the value of their goods. So I have been waiting, and now leaving, with no insurance in place. But good old Hencilla Canworth will be able to sort me out I’m sure; I’ve done it before; it’s just those d**n unreliable artists keeping me waiting! 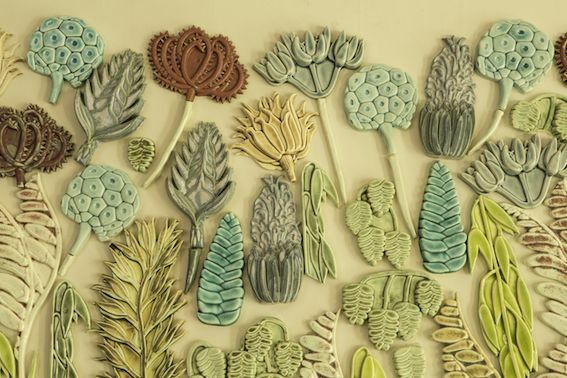 So, a crazy weekend of firing the soda kiln (for 31 hours) and fitting in writing a magazine article about The Ceramic House for Pretty Nostalgic Magazine and mixing 16 glazes, wow it makes me feel short of breath just remembering how non stop and busy it’s been! Closely followed by the commencing of the glazing for the electric firings. Monday was my birthday, beautifully spent furiously mixing glazes and glazing everything in sight. 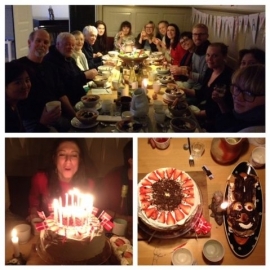 I did actually stop at 6pm in time to prepare myself for a wonderful birthday feast, which ended up being a bit of a surprise because so many new people arrived on that very day and then several more people came who had been invited especially, so many we couldn’t remember who we’d actually invited! It was really sweet; everyone rallied to the occasion; Jim Lawton made Bouillabaisse, Rachel Van Wagoner made a monstrous Danish birthday layer cake, I bought some incredible cream bunny concoctions, and they even made a Happy Birthday banner and decorated everything with Danish flags. It was wonderful. 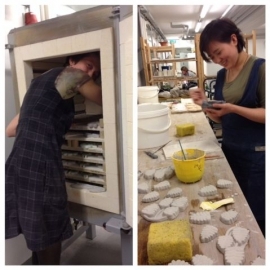 Quickly followed by a change out of my party dress into my studio gear and then Egle and Won offered to help me glaze and pack the kiln, which was a godsend. It was because of them that I got that first main electric glaze firing on at 2am the night of my birthday. Won even helped me again the following day, April Fool’s Day, to finish glazing everything that was left over and we shared another glaze firing. Also Asger Kristensen came to visit, and dropped off boxes of his work and of Lone Borgen and Karen Harsbo. So I now have many, many boxes of artists’ work to try to fit into my already overfull car! Apparently Rachel, who is the studio manager here, is a wizz at packing, and she may say we will fit in all in but I have my doubts. She hasn’t seen all the boxes! Tonight I did a presentation of my work to all and sundry, which is quite a few now as many new artists have arrived in the last 2 days. All of a sudden we are quite a posse, 12 or 13 I think. But for me it’s down to my last two days now…still got a LOT to do! 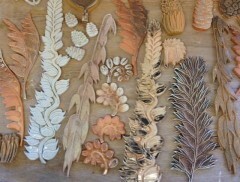 The big excitement over the past few days has been the soda wood firing I did at the weekend. Because the test results from the soda firing a couple of weeks ago were so beautiful, I decided to put some pieces into the next one. Then, when I was selected for the HOUSE Open exhibition at the Regency Town House exhibition during the Brighton Festival, it all fell into place. I decided to make two wall pieces using the same forms, in effect creating double the amount of work, one glazed with a selection of glazes I developed last summer when I was here and the other with the new soda fired pieces. So I will be exhibiting two versions of the same work simultaneously, one at The Ceramic House at the other in one of the main exhibition venues in central Brighton, which is perfect because each will advertise the other and will hopefully attract more audience to both. 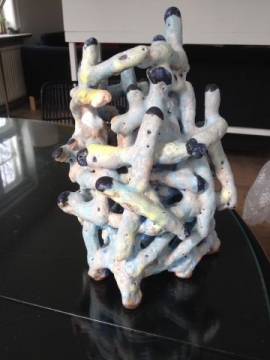 Then, I plan to blend the two pieces into one very large installation that will be exhibited in Rønne Library in Bornholm during European Ceramic Context from September to November. So that is why I have been working very hard indeed slip casting non stop for days on end, because I suddenly had to make twice the quantity of pieces I had originally planned. Last week I put two more bisque firings on, only one of which came out in time for the soda firing, which means I am missing a few pieces for that version, but it will be different anyway. 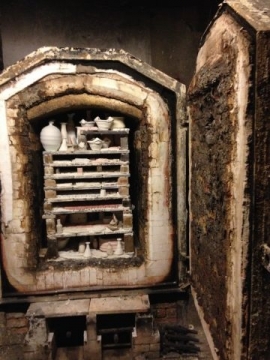 The third bisque kiln had an electrical fault during the firing, and we couldn’t tell how high it had fired to. It ended up very under-fired and therefore very fragile – more than a few of my pieces fell apart in my hands. Friday we started loading up the soda kiln. It’s a beast of a thing, charred, blackened, sooty and huge. 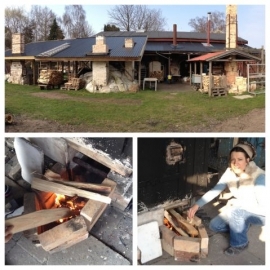 I was sharing the firing with Christian Bruun, a Copenhagen-based potter who comes to Guldagergård to use the soda kiln. It’s a science I do not understand, soda firing, so I left it up to the experts to plan all the packing and firing schedules. 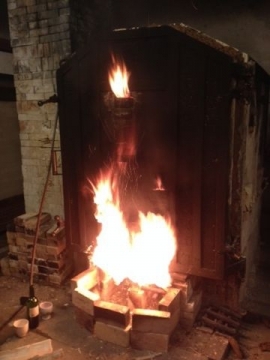 Essentially, it’s a wood firing, and the fire is started up slowly, building up the temperature until it reaches around 1300º, and then soda crystals are fed into the kiln chamber up to 12 times, allowing the soda to evaporate and form a glaze together with the ash from the wood on to the surface of the ceramics. 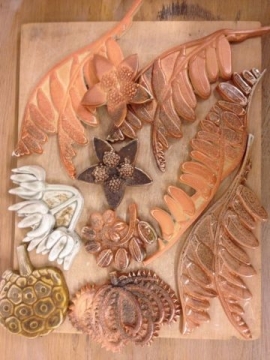 Then after all that, the kiln is “down-fired”, which means controlling the lowering of the temperature, which increases the colours in the glazes and clay bodies. It consumes a lot of wood!And requires a lot of patience and watching. But we were blessed with lovely weather and Christian wanted to take the night shift, which meant I had three shifts daytime and evening. The whole thing took 31 hours, starting at 10am on Saturday morning and finishing around 5pm on Sunday. It’s a lot different to simply filling an electric kiln and turning it on and then coming back 2 or 3 days later to open it up. For now we have to wait until Thursday this week to see what the results are… I am so curious! And it is so interesting that before I came I would have sworn I will never do wood firings, because I was not convinced and did not understand what extraordinary colours and textures can be achieved. And that is what inspires me above all in my work: colour and texture. So it’s plain to see how beneficial coming on residencies like this is – new things happen and grow and turn everything around. Which is great. 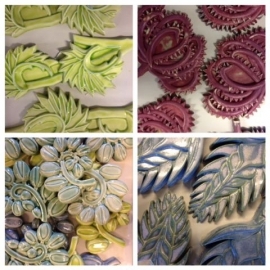 I trained in public art and design, specialising in ceramics, graduating from Chelsea College of Art in 1995. For over 20 years, I have been producing public realm works around the UK and internationally. In 2011, I launched an evolving project, The Ceramic House; my home, gallery, and a living work of art, which I am covering with permanent ceramic and glass installations. Every May, I curate exhibitions of international contemporary ceramics at The Ceramic House during the Brighton Festival. In addition to working on public and private architectural ceramic commissions, recently I have been developing large-scale ceramic installation pieces for exhibitions which have been exhibited nationally and internationally.